Chic Beauty Academy will be running Level 3 Beauty Courses in Luton and Birmingham this September 2017. BIRMINGHAM – Starting Friday 8th September 2017. Every Friday from 10am til 4pm. 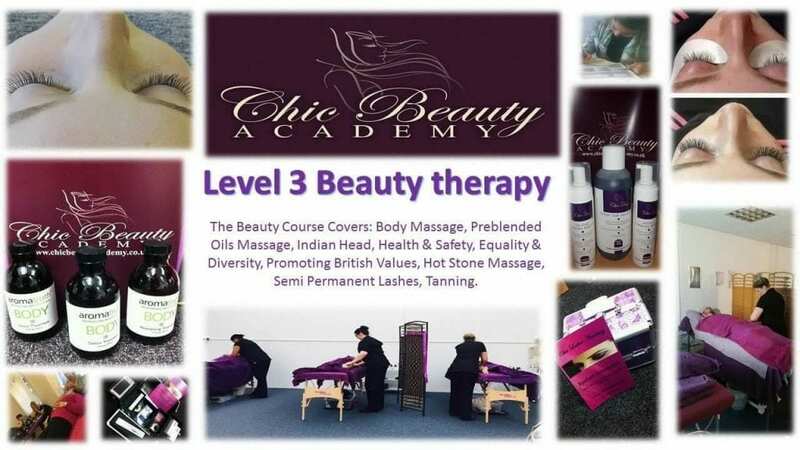 Our Level 3 Beauty Course runs for 22 weeks and covers: Body Massage, Pre-blended Oils Massage, Indian Head, Health & Safety, Equality & Diversity, Promoting British Values, Hot Stone Massage, Semi Permanent Lashes and Tanning. Complimentary starter kits will be given to learners with full attendance upon completion of our 22 week course. For more information or to enrol, please call 01642 880034 or use our contact form.